My father (green card holder) applied for F2A application for my mother and us 3 siblings sometime on 2015. He didn't get any notice, so time flies by. Last year (latter 2018) he tried to look on what already happened on his application and asked for help with an attorney. He found out that he already got an I-797 (Notice of Action) but was not sent to him and returned to sender because he changed address and phone number. What's written on the I-797 are: Receipt date Nov 3, 2015, Priority date Nov 2, 2015 and Notice date Mar 2, 2016. When we looked on the visa bulletin that priority date has already passed on August 2016. When we tried to fill up our DS-260 online, we are all case status ready except on my elder sister on which not applicable is written. As of now I'm already nearing 23 years old and my younger brother 22 years old. I searched online and found that we should have filed our application within 1 year the priority date after becoming current. We (us the family) haven't been sent any notice (mail, call, letter) regarding any of this. We aren't knowledgeable regarding with this kind of matter and we don't know what to do. CSPA = your actually age - ( total time it took from priority date NOA1 to the case approved at USCIS NOA2). 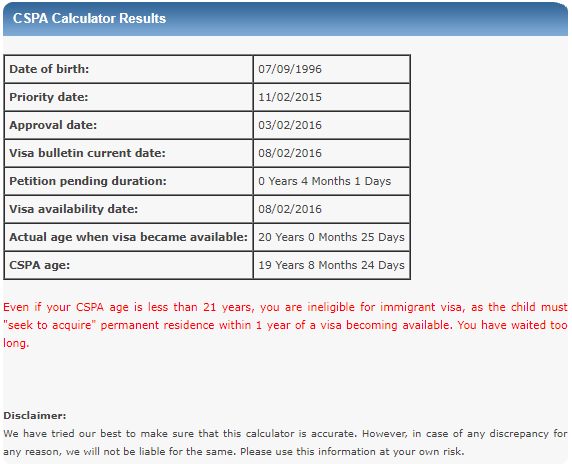 If CSPA > 21, then generally you/your brother is no longer eligible for Visa. You/your brother will need to wait until your father has US citizenship but the waiting is like 7 years now. If CSPA will be 21 very soon, then send a request to your consulate for review as they may grant early interview. We only got one NOA and what is written on it is (on my previous post): Receipt date Nov 3, 2015, Priority date Nov 2, 2015 and Notice date Mar 2, 2016. Are we supposed to get another NOA? And to whom is it sent to (us the family or the father in US)? About the CSPA, I don't know the about the NOA2. But basing on what I have, priority date is Nov 2, 2015 and supposed to be current date of Aug, 2016 which is 9 months. I am now nearing 23 and my brother 22 so I think we are beyond 21. I tried some CSPA calculator online (check attachments) although I'm just confused. When we are checking on our case status on CEAC Status Checker it shows Status Case Ready but we are not receiving any contact from the other side. Does this mean it is just as good as invalid? Are they supposed to contact us (the family) in regards to any of this because the only communication my father received is a NOA which supposedly came March 2016 but only found out on latter 2018. Or are we at fault for not following up on this matter? Has your father discussed with his lawyer? There should be 2 notices, one when the application was received (NOA1), and one was approved at USCIS(NOA2). It looked like the case got approved very short: 4 months from Nov 2015 to Mar 2016. The NOA1/priority date, NOA2, and the date when priority date are important to determine the CSPA age. *In my case, it was not sent to my address but my wife's. In a few cases I know, they normally did not automatically close the applications when they had not heard anything back within a few months but they would also try to send 2nd notice. During the waiting, did you move? I would assume they sent something but lost. This should also take account of date when visa is available. My father already talked with an attorney and said he can't do anything anymore because the documents are already sent on the local embassy (applicant). We didn't change address but we didn't received any form of contact. I would assume even the CSPA won't matter because we are beyond the 1 year allocated for filing of application (Aug 2016 current). I assume there won't be any interviews even if filled up the DS-260 because it is long overdue and didn't contact us. Can the F2A be changed to F2B or my father should file another petition? Any suggestion on what should we do next? We are totally clueless on things about these. I think your father/lawyer/and you should try to contact NVC and consulate to confirm if there is any hope and if new petition is required. There may be other members who have better knowledge and will give you some insights. In any case can you give some comments about my attachment? When we just knew (latter 2018) about our case we checked the CEAC status checker that's the result. Will that by any chance extend our chances? Unfortunately, it's too late. CSPA will not apply and will not help because your family failed to file DS-260s within one year of your PD becoming current. The petitioner was notified. He didn't get the notice because he did not inform USCIS that he moved as required. USCIS and the NVC also contact people through e-mail, did your father sign up for that? At this point, your father may want to consider filing new I-130s in the F2b category and asking for retention of your original PD. And make sure that USCIS and the NVC has current email addresses and home addresses, and keep them updated so you do get notifications. And you should check the Visa Bulletin and be aware of when your PD will be current. It's generic. Everyone who files a DS-260 will get this. Just to let u know that case is ready for interview. Neither good or bad, just that case is moving along. Go to the interview and hoping your visas gets approve. We'll try to talk with an attorney for legal help regarding this matter as we (applicants) didn't receive any form of contact from NVC such as PD becoming current or the supposedly termination of the application (long overdue). 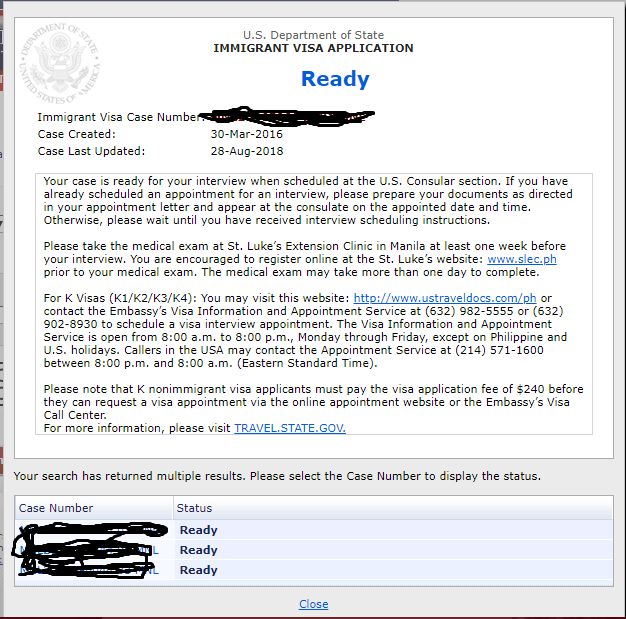 I read on the internet that the NVC should have contacted us on both cases and the status cases should have said "Expired" (in reference to visa status meanings https://www.upcounsel.com/ceac-visa-status) but still shows ready. It was your father and your family's responsibility to USCIS and the NVC with your current contact information. You guys didn't do that. You are also responsible for being on top of your cases. There isn't anything for an attorney to do. I do think the fault lies on us and I do think that this is much a pretty lost cause. We are not really knowledgeable regarding these things but still doesn't excuse us on this very big lost opportunity. We are trying to look for an attorney regarding on which best steps should we take as per suggestion (e.g. 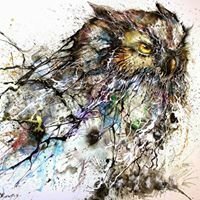 filing for F2B on a new petition or such things). Although this is such a very big lost opportunity, this is not the end of the world for us. I'll post again when we get results. Separately, it appears your father is not aware that it is mandatory for green card holders to notify uscis of any change of address within 10 days, whether or not there is a petition in progress (but if there is it is obviously critical to do so, as you have discovered to your cost).